Tourists and business travelers from Russia will now be eligible for multi-entry visas valid for up to three years. The US Embassy in Moscow said in a press release that, starting Sept. 9, tourist and business travelers from Russia will be eligible for multi-entry visas valid for three years (visa type В1/В2). No additional documents will be required. Moreover, the Embassy has said that Russian citizens will no longer have to present formal invitations, lodging confirmation, or ticket reservations. The $100 visa fee will fall to $20 , although the $160 application fee will still apply. Authorities in the U.S. have also committed to keeping standard visa processing times under 15 days. The processing and fees for other visa types, such as those required for workers and journalists, will not change. 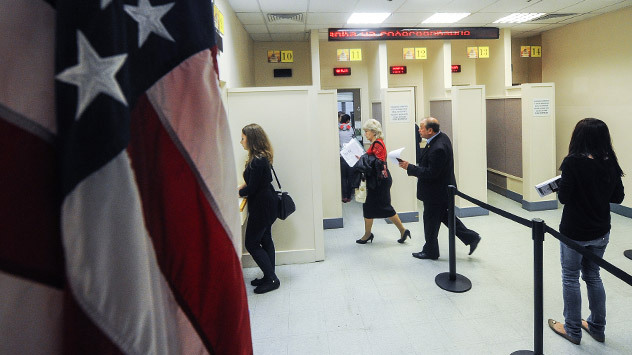 The U.S. Embassy has already simplified the visa rules for Russian citizens twice in recent years. In 2008, applicants who had previously received a U.S. visa within the past 11 months were exempt from interviews and fingerprinting. In March 2012, the "grace" period was extended to four years from issue of the previous visa. The simplified rules affected holders of tourist, business, and transit visas. Currently, Russian citizens who have already visited the U.S. do not, as a rule, have any direct contact with the U.S. Embassy at all, as all supporting documents are handled by a courier service. These applicants for tourist visas are not required to enclose ticket confirmations or hotel reservations, unlike visa processing rules at European consulates. The U.S. Embassy links these previous changes to President Barack Obama's program to attract more tourists to the country. A total of 64 million foreigners who visited the United States in 2011 spent $152 billion there. Still, the U.S. State Department has named China, India, and Brazil among the priority locales from which to attract tourists, not Russia. This current round of simplifications to visa formalities was dictated by a U.S.-Russia visa agreement, which was signed in July 2011 and ratified by the Russian State Duma a year after that. The American Embassy called the agreement "historic" and promised that three-year visas would become the "default" terms for standard visas. More and more people from Russia are visiting the United States each year. According to Rostourism, 112,000 Russians visited the U.S. in 2011- almost a third more than recorded a year before. The U.S. Department of Commerce told Kommersant that 92,200 Russian citizens visited the U.S. between January and May of 2012 alone. Under the bilateral agreement, Russia has also undertaken a reciprocal obligation to issue three-year visas to U.S. applicants; although, unlike Russian citizens, Americans must continue to hold advance lodging reservations for a tourist visa. Americans in Russia, along with Russian travelers in the US, will now be permitted to stay up to six months, where the previous restriction limited stays to three months. In 2011, then-Prime Minister Vladimir Putin even proposed to U.S. Vice President Joe Biden that visas between the two countries be waived altogether. Boris Samaryanov, Vice President of the Association of Tour Operators of Russia believes American tourists stand to gain more from the agreement than Russian tourists. "They will now be able to obtain three-year visas, whereas one year was the limit before. Our citizens who are eligible for American visas can obtain them for two years already. Three-year visas will only save them a page in the passport", he said. Samaryanov believes that the small decrease in the visa price will not affect the tourist flow, with a plane ticket to the U.S. still averaging $1,000.